The Dow traded in a 900-point range on Monday proving there is still significant indecision. 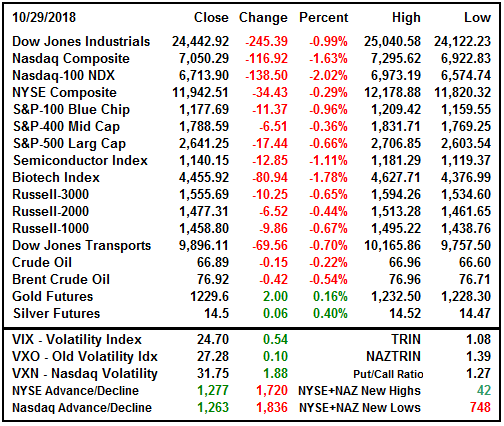 The Dow rose 350 points, then crashed to -550 as headlines and earnings continue to push investors to the sideline. However, the afternoon market crash was very aggressive and short lived and the rebound was equally aggressive. 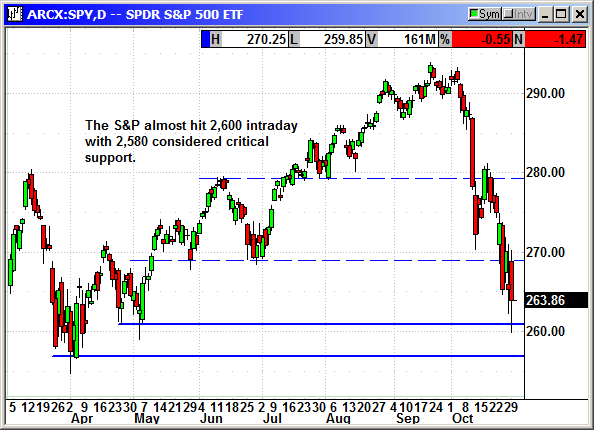 The S&P came very close to touching 2,600 and critical support just above technical level at 2,580. News that the administration was threatening to add another $267 billion in tariffs on China if the G20 meeting with President Xi did not go well, pushed the market to its lows. This should not have been a surprise since President Trump has been threatening it for the last two months. This just shows how skittish traders are that they would react so violently to old news. JP Morgan and Goldman Sachs are telling investors to buy the dip but Morgan Stanley came out today saying the current correction was going to turn into a bear market. That was not a trader-pleasing headline. The Dow rebounded back from its -550 low to lose -245 at the close. The Nasdaq index continue to implode and fall deeper into correction. 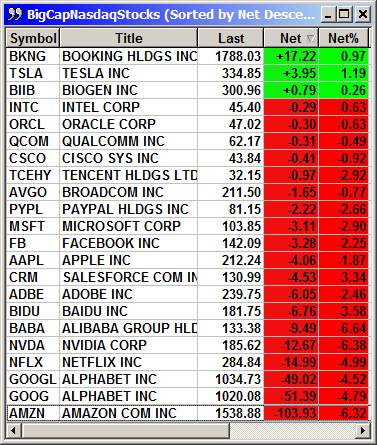 The sector indexes are rotating daily for the biggest loser spot but they are all movinf deeper into the red. 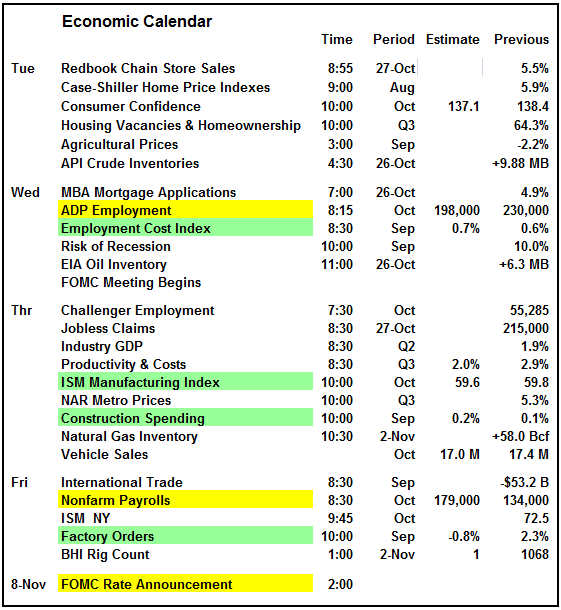 The calendar is devoid of any material economics on Tuesday but the payrolls and ISM will give analysts something to worry about the rest of the week. Closer to the weekend the angst will begin to rise over the FOMC meeting next week. 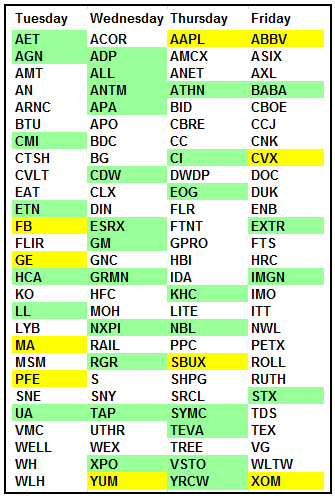 The big earnings on tap for Tuesday are GE, FB, MA and PFE. Facebook will get the most headlines by far although GE could be a close second given the new CEO and the restructuring plans. Facebook finally broke support at $150 and traded under $139 intraday. They are extremely oversold and could be due for a monster spike if they beat and guide higher. Analyst worry they are going to guide lower because of added expenses related to hiring 20,000 people to work the fake news problem. The S&P came very close to the round number support at 2,600 but the real number to watch is the 2,580 support from Feb and April. The S&P was in recession territory at -11.1% today and just barely closed above correction at -9.86%. That is close enough for me but I do not get a vote. 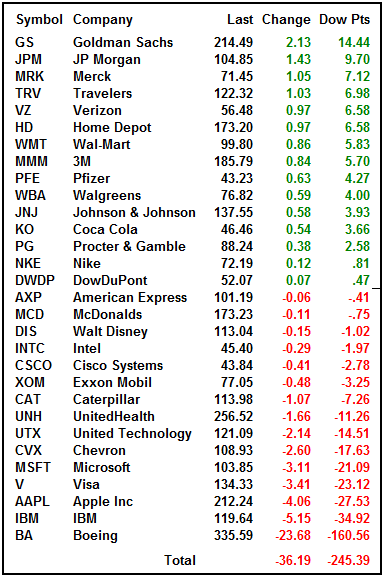 The Dow was crushed by selling in the industrial stocks and Boeing was a major drag with a -$24 drop. That knocked -160 points off the Dow. IBM fell sharply after announcing the acquisition of Red Hat for $34 billion. Apple fell $4 ahead of Tuesday's product event and Thursday's earnings. 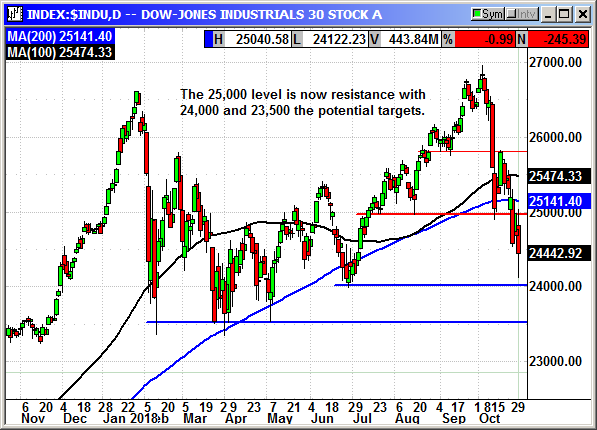 The Dow came very close to round number support at 24,000 but the real target on any further decline is 23,500. The Nasdaq was sinking mostly because of Amazon and Google but Netflix and Nvidia were helping. 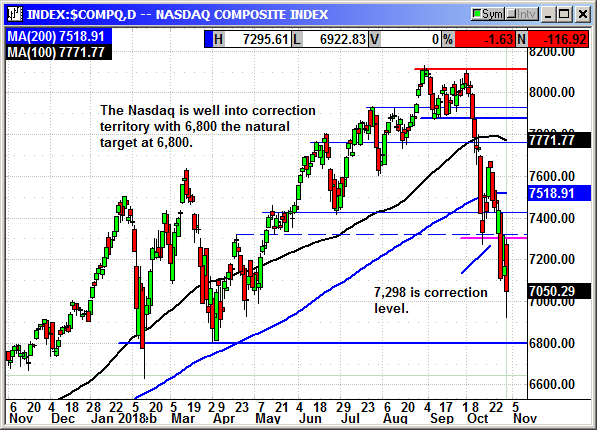 The index is well into correction territory and the natural target is now 6,800. Earnings from Facebook and Apple will be the big drivers over the next several days. 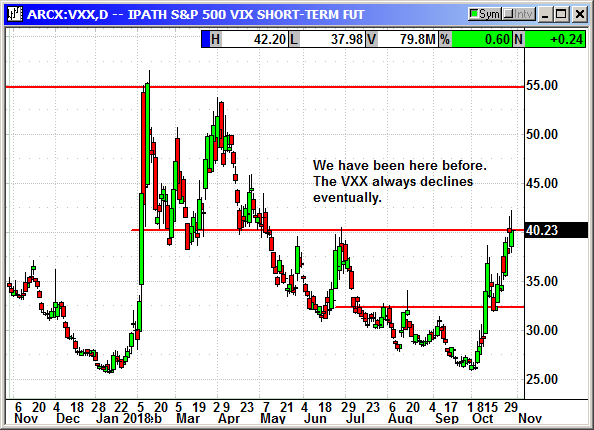 There could be extreme volatility in both directions. The Russell was the strongest index but it is also the most oversold. 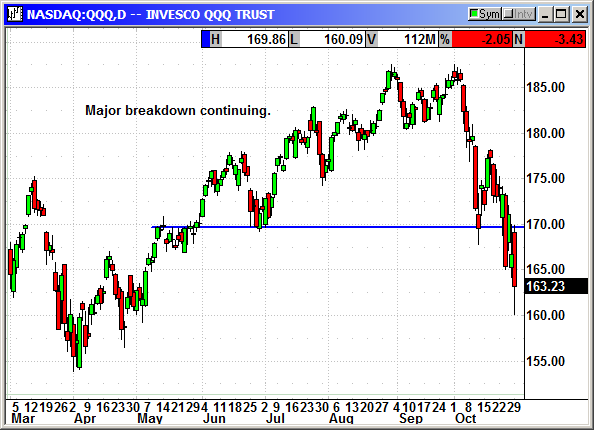 It has already reached its critical support from February while the other indexes are still headed in that direction. This was the third day where that level has held. 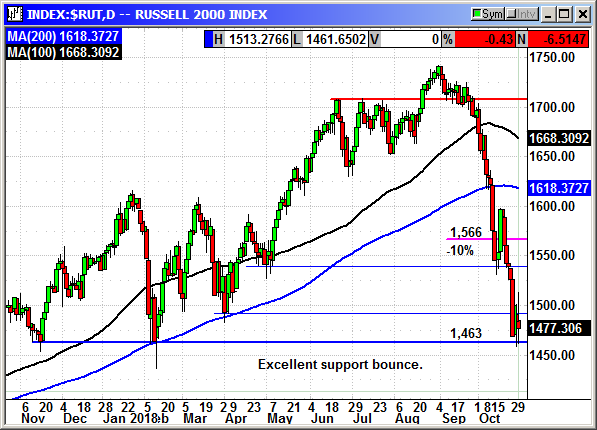 If we could get the Russell to begin leading the charge higher, it could trigger a positive change in sentiment. The markets are severely oversold. We are due a major bounce but that is exactly what is said at the start of every bear market. While I do not believe this will morph into a 20% decline there is always that possibility. I am an aggressive trader and I would be taking small trading positions on stocks that have stopped declining. 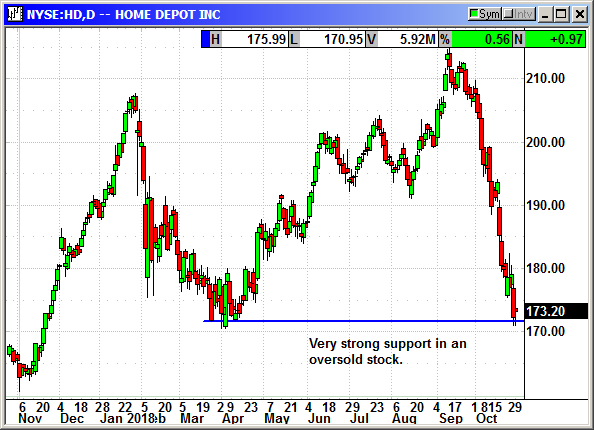 I am recommending Home Depot today as one of those stocks. I wanted to buy speculative calls on Facebook but the earnings risk there is too great. I would urge caution until the market actually turns positive for more thn one day. We know the first strongly positive day is going to produce a major short squeeze but we saw what happened today. The morning rallies have been routinely turned into afternoon declines. Be patient. Wait for the correction to end. Buy Jan $185 call, currently $3.90, no initial stop loss. 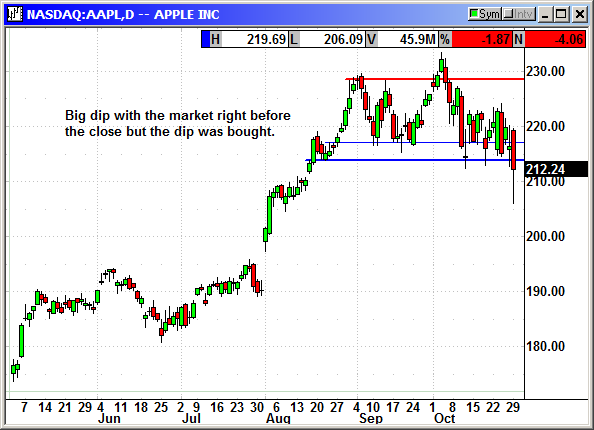 Apple continues to be volatile with the market and it will be the earnings leader this week. The company reports earnings on Thursday. On Tuesday they have a product announcement in New York and that is expected to be an updated iPad and Mac computers. It is interesting they chose to do this two days before earnings. Should we derive some sort of message from that scheduling? The Nasdaq 100 continues to implode and there is nothing we can do about it. We would need a major six week rally to reflate this position. At the current 23 cents there is no reason to close it. If we could get a week or two of gains we could sell some calls against our long position to recover some money. The S&P has also been volatile but not as bad as the Nasdaq. 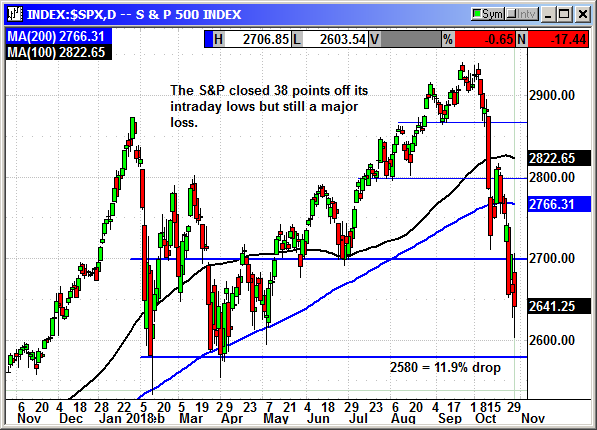 We could actually see the S&P recover the $280 level. The VXX is retaining volatility with the Dow's wild 900 point swings. This is temporary. The VXX always goes back to single digits when the market is in rally mode.